Peaceful morning. I try to pray and I sit and nothing happens. Should I be upset? Is God to be subject to my command to appear and disappear on cue? In the parlor some of the priests on retreat sit and chat about the standard concerns of the clergy: gutters, roofs, money. "The spiritual life is something people worry about when they are so busy with something else they think they ought to be spiritual." "I an age where there is much talk about 'being yourself' I reserve the right to forget about being myself, since in any case there is very little chance of my being anybody else." "Who was that hermitage I saw you with last night?" To be consoled or encouraged in the experience of prayer is great, e.g. by the gifts of feeling peaceful, feeling an experience of God, feeling a sensible faith, etc. But the danger is to come to expect these things, or worse, to pray in order to get these feelings. At that point, since we've descended to the level of "what do I get out of it," we're spiritually safer just going to Target instead of praying. That is to say we're better off admitting our consumerism instead of indulging it with a greed for spiritual "experiences." The goal needs to be faithfulness to prayer without encouragement from the experience itself, perhaps without even an "experience of God," whatever that means. And then, coming away from prayer, we need to careful not to fill our lack of consolation with the first indulgence that presents itself. The world is all too happy to find us in this condition, and has made any number of cheap substitutes for spiritual consolation readily available. It is a joy to be here as a priest and to concelebrate with the monks at their conventual Mass--and to be able to offer Mass for the intentions that are in my heart. One thing I miss though: being given Holy Communion. I was always struck by the way they did it here. It was clear to you that the priest saw himself as handling something precious. It was just the way they held it and put it in your hand. You don't always get that at a regular Mass in a parish. I try to keep this in mind as a minister of Communion myself, but I know that you can have a lot of your mind at Communion, e.g. keeping an eye on the extraordinary ministers, trying to judge whether or not you have to go to the tabernacle, watching people to make sure they consume, etc. Nevertheless, it is an important catechesis to behave with the holy Eucharist as if you were handling something precious, and unworthily at that. Most people, as you get to know them, seem less strange. You get to know what 'makes them tick,' the origins and values behind their behavior, their eccentricities, etc. This is not my experience with God--God seems to be the opposite. At the beginning you have a lot of clear ideas about the content of the utterance "God." But as time goes by, it becomes much more cloudy. What or Who is this "God?" Easily we say God is not this or that, but what is God? Words become weak--the lines between description, metaphor, and name are blurred, e.g. Source, Ground, Spirit, Word, Father. In this atmosphere prayer easily becomes a kind of vertigo--what is the Is on the other end of this conversation--the I AM? 1. The need to live in mystery willingly, to take the step into the cloudy unknown, to mortify and escape from the tyranny of the conscious mind and its "understanding." 2. To seek Jesus Christ and him crucified. "He who has seen me has seen the Father." Whatever God is, our confession ( and the truth into which we are baptized) is that Christ crucified is the revelation of God's truest Self. I'm off for my annual retreat this week, not to return or have any contact with the blogosphere, internet, or telephone until I return next weekend. I'm going to the Trappists in Massachusetts, which has been my favorite retreat destination for about ten years. So pray for me. I'll be offering Mass over the course of the week for some of the intentions I've received from friends I've met here, including the discernment and vocation of Michael Hallman and the health and recovery of Paula's parish priest. Today is a day of joy for the Capuchin Franciscan Order, as one of our own is beatified. Blessed Jacob of Ghazir lived through the first half of the last century and was called "the Lebanese St. Vincent de Paul." His beatification takes place today in Beirut. You can read some more about him here. What we hear in the secret of our praying heart we are to proclaim boldly to the world. My homily for this weekend is posted here. Sometime before I was in religious life I went to a Catholic youth event run by, I think, the Franciscan Friars of the Immaculate. In the course of the evening there were opportunities for confession and to be invested in the Brown Scapular. I took both, and tried to maintain the wearing and the devotion of the Scapular after that. When I was invested with the Franciscan habit in 2001, I considered myself absolved from my investiture with the Brown Scapular. The Scapular derives, after all, from the Carmelite habit, so I figured that, being invested in one habit superseded the other. Am I right? Or have I failed to maintain the devotion and duty I accepted? Not that it applies to me, but a friend sent me this Facebook search result that shows that it's tough out there. Sorry for the slow posting this week, but it's been a little crazy: I have three weddings in the next eight days and am trying to prepare the paperwork for a fourth to be celebrated in Spain. I've been overseeing the installation of a new telephone system and planning a trip to the circus for the altar girls and boys. Good thing I'm going on retreat next week! I'm miserable because the miserable state of religious life/regular observance/our ministry/the Catholic Church is making me miserable and preventing me from being the kind of religious or minister I want to be. I'm depressed because I have to do all kinds of things that I didn't sign up for and have nothing to do with my vocation, e.g. in my case, fixing the PBX, reseting the T1, pumping rain water out of the church hall, etc. If only I was in a vibrant parish/province/order/church then I wouldn't have to worry about such things and could happily spend my time on better things. All of these are examples of the same trick by which we lose sight of ourselves and blame everyone else for our unhappiness, depression, and misery. It works well because it relieves us of the spiritual responsibility of looking after the only person or thing around us that we can actually control: ourselves. When it gets really bad we just stop noticing or worrying about our own sins--which are the actual cause of our unhappiness--and take up the rotten pleasure of noticing what's wrong with everybody else. In order to practice the first counsel, concerning resignation, you should live in the monastery as though no one else were in it. And thus you should never, by word or by thought, meddle in things that happen in the community, nor with individuals in it, desiring not to notice their good or bad qualities or their conduct...you should engrave this truth on your heart: you have come to the monastery for no other reason than to be worked on and tried in virtue; you are like a stone that must be chiseled and fashioned before being set in the building. Thus you should understand that those who are in the monastery are craftsmen placed there by God to mortify you by working on you and chiseling at you. My emphasis. Translation of Kavanaugh and Rodriguez. "From age to age you call a people to yourself, so that from east to west a perfect offering may be made to the glory of your name." (Eucharistic Prayer III) God gathers us together to be that priestly people who are called to make of ourselves and the world around us a pleasing sacrifice of praise. My homily for this weekend is posted here. I took the SAT back in 1989, on paper. It wasn't until 2002 that I took another standardized test when the now defunct Weston Jesuit School of Theology sent me to Osh Kosh to take the GRE. In the meantime, everything had changed. I had to take the test at a computer terminal, and the whole feel of the thing was different; I had never encountered "computer adapted testing" before. The idea is that the test judges your level from your answers and provides the next questions and problems accordingly. Answer well, and you will receive more advanced questions. Answer wrongly, and the level at which you are being tested decreases. Therefore, in the course of the testing you can be passing or guessing on a lot of parts, feeling as if you are really failing the whole thing, but it might turn out that you are failing at a very high level! You may have ascended to your level of incompetence, but if that level is relatively high, you are scored well. I only think of all this again because it's been coming to me as a metaphor for the spiritual life of some of the people I've met in my ministry. They feel as if their spiritual life is in shambles, that they are failing miserable in their obligations and promises to God, but their spiritual vocabulary and precision of discernment reveals that they must be very blessed by the indwelling Trinity and--in some sense--quite advanced in their prayer and spirituality. They feel like they are failing, but they are failing at a blessed and advanced level. And what more could we want, that grace should shine through our weakness and reveal God alone, without any admixture of our rotten pride? Therefore, be sure you always put the needs and concerns of widows, orphans, and the oppressed ahead of your own and don't become that priest who wants to accept public greetings, places of honor and banquets and events. This is honestly one of the most disturbing things I've ever seen. The drivers who hit the poor man just drove off. Others drove around him and kept going. Finally the cops happen by and do something. I don't see how anyone can say that there isn't something fundamentally wrong with our culture. Our willingness to live with abortion, poverty, execution, and illegal wars waged on false pretenses have damaged our perception and consciences to the point where we are able to ignore the immediate need and suffering of a human life right in our path. How can our world be converted to the path of putting some value on human life? On Saturday we're going to ordain three more priests for the Order. As I talk to them I tell them that they will be in a daze for a few days. Once they settle down though, and are able to pray again at Mass--when they no longer need to simply concentrate on doing it right and not forgetting anything--it becomes quite a spiritual adventure. One joy that I didn't anticipate about priesthood is how, in the course of this first year, it all becomes new again as I celebrate each annual observance. Celebrating Midnight Mass on Christmas--the feast of the Incarnation--opened up the mystery of the Eucharist in a more expansive way. It was the same with Easter and Pentecost through those respective angles on the one mystery of Christ. 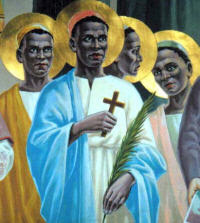 Today is another one of those days, as I felt awed to be called by God to celebrate the Eucharist on the feast of the saint who is the patron of my own baptism: Charles Lwanga. To offer the broken body of Christ to the Father in Holy Communion with the broken body of St. Charles, it almost overflows my mind with wonder. It keeps me mindful of the last words of my formation director before I was ordained priest: "Remember the Communion of Saints. It's the only way this makes sense." Indeed. That I took Charles Lwanga as the patron of my own baptism was a genuine work of Providence. I didn't even know enough about him or about how my own journey would unfold to understand it at the time, but there are enough resonances between his martyrdom and the ascesis of my own journey to make me certain that he was meant to be my patron and that my own religious vocation has been kept alive through his intercession. I've appreciated Weezer ever since the "Blue" album came out around when I was graduating college. Simple, un-self conscious rock and roll with a persistent melancholic strain--what could be better? Their new single, "Pork and Beans" is a little on the silly side, but is no exception. The video just passed five million views on YouTube, and as well it might have; it is a kind of mash-up of internet "celebrities" and "memes." As I've watched it, though, it's made me sad. As an homage to the creative riffing of memes and the unlikely individualism of the internet, it embodies exactly what it both mocks and celebrates. Unfortunately most of it isn't really about anything meaningful...making it a kind of meta-telling of a meta-telling of a story with no point. My reflection on it made me think of Merton's reflection on television; one only has to replace "television" with "the web." I am certainly no judge of television, since I have never watched it. All I know is that there is a sufficiently general agreement, among men whose judgment I respect, that commercial television is degraded, meretricious and absurd. Certainly it would seem that TV could become a kind of unnatural surrogate for contemplation: a completely inert subjection to vulgar images, a descent to a sub-natural passivity rather than an ascent to a supremely active passivity in understanding and love. It would seem that television should be used with extreme care and discrimination by anyone who might hope to take interior life seriously. New Seeds of Contemplation, 86. That's the kind of text that hooked me into exploring the Catholic tradition in the first place. But for what it's worth (and I imagine little) I find the song fun, despite the "inert subjection to vulgar images."